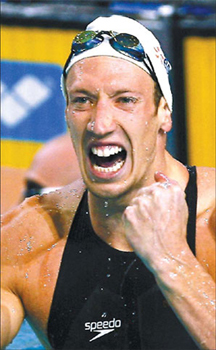 ANTIBES, France: France's Alain Bernard, who broke three world swimming records in as many days, was perfectly happy to lose one of them soon afterward. "Somehow, it proves that I am not alone," the Frenchman said in an interview. Bernard established himself as the new sprint king at the European championships in Eindhoven in March, bettering the showcase 100 m freestyle record twice before setting a record for the 50 m freestyle. The shorter record was recaptured a few days later by the man Bernard took it from, Australian Eamon Sullivan, setting the scene for an exciting showdown at the Beijing Games in August. "At a moment when people are questioning my performances, I'm glad to see him join me," said Bernard of Sullivan. The 24-year-old Bernard, who was unheard of outside swimming circles a year ago, had been hurt by suggestions that illegal substances might have helped him to make such a sudden impact. In Eindhoven, Italian rival Filippo Magnini told Italian media the Frenchman had "found the right vitamins". "The Italians should not give us any lessons on doping," Bernard told Reuters. "Unlike France or other nations, they've already had swimmers test positive. From now to the Olympics, I know they will do it (criticize) again. I will need to protect myself." Bernard started his Eindhoven show by clocking 47.60 for the 100, smashing Dutchman Pieter van den Hoogenband's mark of 47.84 set at the 2000 Sydney Games. The next day, Bernard clocked 47.50 and the following day, he set a best mark for the 50 in 21.50, breaking Sullivan's record 21.56. Sullivan has since lowered Bernard's mark twice to put the record at 21.28. Once a lanky teenager with hardly promising credentials in backstroke and medley swimming, Bernard has since successfully switched to freestyle and is now as heavily muscled as a comic superhero. The discreet but resolute Frenchman, who stands 1.96 m tall and has an armspread of 2.05 m, was nicknamed the "hovercraft" by former top French sprinter Bruno Gutzeit, who sees Bernard as the ultimate swimming machine. Recurrent backpain, a result of a rapid growth spurt as a teenager, put the brakes on his progression, but he compensated by working extremely hard to improve his technique and develop his once frail body. The Frenchman, who missed the 2004 Athens Olympics because of mononucleosis (glandular fever), did not burst into the limelight until clocking 48.12 for the 100 at the 2007 French championships. Now a celebrity in France, Bernard, whose role model is Russian great Alexander Popov, is doing his best to cope with all the attention. "I queue up a lot longer at the post office but people are really nice to me," he said. "I don't want to become a star. I must not. I'm proud that people recognize me but I don't swim to become famous." He swims to go fast. Bernard, who raised a few eyebrows when he said in an interview in February he could swim 47.50 for the 100, now believes swimming under 47 seconds should be feasible. "The only way to keep improving is not to fix yourself any limits," he said.